Nowadays, hackers don’t even have to see your credit card to access the information on it. They can scan it from a safe distance. One of the latest threats against travelers is invisible and silent: wireless attacks that siphon your credit card number, personal information and passwords. Anything with a radio-frequency identification (RFID) chip, including your passport or a credit card, can be read from afar. Thieves can also mine valuable data from your smartphone when it automatically logs on to a WiFi network. One-third of phone users store their passwords to online accounts, including bank and social networks, on their devices. Fortunately, there are a few simple ways to thwart these wireless assaults, including new luggage products and common-sense steps that protect your devices and credit cards. This month, luggage manufacturer Briggs-and-Riley, based in Hauppage, N.Y., will add RFID-blocking pockets to its new at-work briefcase and bag collection. The models offer two pockets with electromagnetic shielding, one for IDs and passports, the other for a smartphone or a tablet computer. 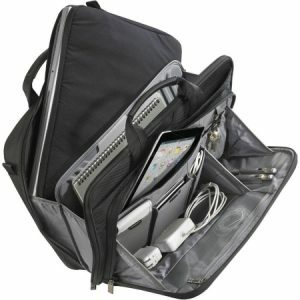 The black ballistic nylon cases, priced from $129 to $479, are designed to appeal to privacy-conscious business travelers.